Katie's Cards have announced that they will be releasing two new ecards just in time for Mother's Day on Sunday. CEO Katie Davies hopes that by continuing to add to the collection, the company will keep current members satisfied and will also encourage more people to join Katie's Cards. “If one ecard gets particularly positive feedback, we try to adapt it to suit different occasions. This is a win-win situation because it enables us to keep our members happy whilst simultaneously widening the selection of ecards available." Katie’s Cards, U.K. ecard provider, have announced the release of two new ecards just in time for Mother’s Day this Sunday. One is a completely new ecard whilst another is an adaptation of a popular ecard released in January. The new Mother’s Day ecard, entitled ‘Spring Buds’, has been created in a beautiful artistic style that signals a continuation of the company’s new creative direction, announced last month. Various flowers, painted in bright spring colours, come to life against a background of subtle hues of green. The lightness in the middle of the backdrop seems to symbolize the sun as it gently warms the ground and makes dormant buds spring to life. The flowers pop out from all corners of the screen: shades of pink, yellow and orange are accented by patches of white blossom, illustrating the new life that comes with spring time. The two new ecards join a wide-ranging collection of Mother’s Day ecards on the company’s website. The collection includes ecards of various themes and styles. From more traditional ecards to those created in a cartoon-like style, to those that evoke the artistic background of their creator, Katie Davies. 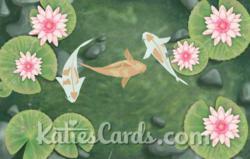 The first ecard created for the Katie’s Cards collection was one that Katie Davies created for her mother. It has always been important to Katie, therefore, that Katie’s Cards members are able to find suitable ecards to send to their own mothers, especially on Mother’s Day. All of the ecards on the Katie’s Cards website are available exclusively to Katie’s Cards members who, for the duration of their membership, can send unlimited ecards from the entire collection. Members can also set up a personal address book, pre-schedule ecards to be sent at a future date and can view a card history which displays the status of each ecard and shows whether it has been viewed by the recipient. At the beginning of the month, the company announced a membership offer which continues throughout the month of March. In this deal, any new joiner who selects a three-month membership will gain another three months for free. Katie’s Cards hopes that this will boost membership during the busy spring months before important dates in the calendar such as St. Patrick’s Day and Easter.